What's the price of a deal with the devil? Devil's Bargain was definitely a refreshing read. Jazz had me sold on the first chapter. She was witty, quirky, powerful and she wasn't afraid to be in a fight or get her hands dirty. I also liked that there wasn't just one heroine. I enjoy the comfortable and easy relationship that Jazz and Lucia fall into. Its like Lucia is the more sensible and carefully refined Jazz. They support each other and I believe that having such a strong friendship in a book is as important as having a good love interest. And James Borden is just that. I like how the relationship between them was definitely more than met the eye from the very beginning but it was a slow, shimmering growth instead of an "oh my god, love at first sight" kind of love which works in man occasions anyway. I don't like the cross society and I liked how the secrets were slowly explained and revealed one by one, but at the same time it left room for the reader to consider the possibilities. Jazz and Lucia really are dealing with the devil because the whole idea of how anything could effect a chain of events or even start one was cool to say the least. I loved the flow and power behind the writing and I expected no less from Rachel Caine. Oh and on a side note, anyone whose read the revivalist series should notice that there are some characters that appear in this book that reappear in her later series. I was like oh my god, that was so cool, like she linked the stories in some way. ;] You gotta read it to find out. It was definitely a worthy read and I think that the people in UK will love it. This book was originally published in 2005 here in the U.S so the galley I'm reviewing is actually the version that is going to be released in the UK. 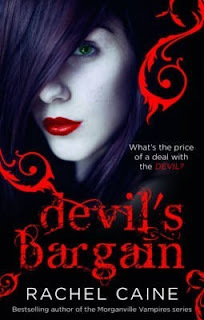 This egalley was provided by Harlequin UK through Netgalley in exchange for an honest review. I give this book a solid 8/10. I really liked it. I would love to read the second book because its about Lucia this time.